Arun valley Trekking provides really superb views of both Mt Everest and Makalu. It is located between the Sagarmatha and Makalu-Barun National Parks. Trekking in this valley provides an alternative approach to the Khumbu region. We recommend this approach to those people who have already been in the Everest region and want to revisit Everest Base Camp (Kala Pattar) via a less traveled route. It is really a Non Touristy area but we can see significant views of Mt. Everest, Makalu, and hundreds of other mountains just on your eye. 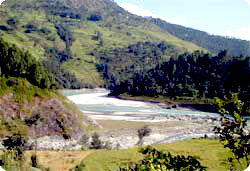 Sherpa, Rai and Limbus are the main inhabitants of this region. Walking north up the Arun river to Sedua and Num, then crossing Barun La(4110m. )into the upper Barun khola valley for a close look at Makalu. You can put together an even wilder trek by crossing Sherpani col and west col into the upper Hongu valley. Highest access of the trek: Kala pattar 5545m. Himalayan sights: Mt.Makalu, Mt. Everest, Mt.Lhotse,Mt.Nuptse,Mt.Amadablam,Mt.Thamserku etc. Splendid breathtaking place : Mt. Everest,Mount Makalu ,Barun national park & Non Touristy trekking trail. Day 01: Arrival in kathmandu 1334m, Himalaya Journey Treks & Expedition’s representative will transfer to hotel , Arun valley trekking briefing with officially arrangements. overnight at Kathmandu. Day 02: Kathmandu valley sightseeing and preparation for Arun valley trekking. Day 03: Katmandu by flight to Tumlingtar. Day 04: Tumlingtar trek to Chyawabesi (280m). Day 05: Chyawabesi trek to Kothe. Day 06: Kothe trek to Salpa Phedi (1680m). Day 07: Salpa Phedi trke to Sanam (2850m) via Guranse (2880m). Day 09: Bung trek to Gai kharka (2300m). Day 10: Gai kharka trke to Puiyan (2230m). Day 11: Puiyan trek to Phakding (2830m). Day 12: Phakding trek to Namche Bazaar (3480m). Day 13: Namche Bazaar acclimatization day. ( During the day , you can hike to Thame for beautiful Himalayan views, wild animals and Tibetan Monastery or hike to Everest view hotel for superb views of Mt. Everest( 8848m) , Mt.Lhotse, (8516n) Mt. Nuptse, (7855m), Mt.Amadablam (6856m), Mt. Thamserku ( 6723m) , Mt. Kantega (6979m), Mt. Kusum Khangaru ( 6367m) , Mt.Kongde (6011m), Mt. Tawache peak ( 6367 m) , Mt. Cholaste (6335m) ,island peak (6179m), Khumbila (God of Khumbu) 5761m etc , overnight at Namche Bazaar. (5500m) and overnight at Gorakshep. Day 22: Lukla by flight Katmandu. Day 23: After breakfast, our tour guide will take to for historical monuments sightseing in kathmandu valley such as Bhaktapur, Pasupatinath, Boudhhanath, Kathmandu durbar square and Monkey temple(swyambhunath) and in the evening farewell dinner in Restaurant, overnight at Kathmandu in Hotel. Day 24: After breakfast, Relaxing/shopping with own activities ,Himalaya Journey Treks & Expedition’s representative will drop to Kathmandu international airport for onward destination.